Looking for a budget friendly easy meal. Here is one we use in our house. It will take you 5 minutes to make with only 3 ingredients. Included as well is a super easy and way healthier gravy recipe. Place the washed, whole chicken in crockpot, and add onions, and salt. Cover and cook on LOW for 10 hrs or on HIGH for 8 hrs. 2-3 hrs prior to the chicken being done, throw in all the chopped up vegetables. Once the vegetables are cooked through, place all the dripping from the chicken in a high speed blender (or vitamix), 1/2 Cup – 3/4 Cup of vegetables (the starch from the potatoes will help thicken the gravy), and 1 cup of chicken broth, blend until pureed. Pour into a saucepan, and bring to a boil. Add salt & pepper if desired, and reduce to simmer until slightly thickened. *If you find that the gravy is too thin, it means that you need to add a couple more potatoes to the blender to thicken it, or you can use arrowroot powder (gluten free thickener) to thicken it. We haven’t had this issue yet though! On another note…this is a GREAT opportunity to make bone broth. At the end of dinner, throw the leftover bones etc BACK into the crockpot, fill with water and whatever spices or veggies you want. Cover & set it on low for 18 hrs, as the longer you cook it for, the MORE health benefits to it. Use it for a batch of Chicken soup the next day OR throw it into the freezer for another time! Jen put this together on a saturday night…thinking she had a bit more time to cook…forgetting we had to rush out the door to church for 5pm. It was pretty impressive to see it come together quickly with minimal effort, and less than 30 minutes! Really tasty, and incredibly filling!! Throw in some toasted cashews and topped with green onions…you won’t be disappointed in this. Trust me. I served it over cauli-rice. 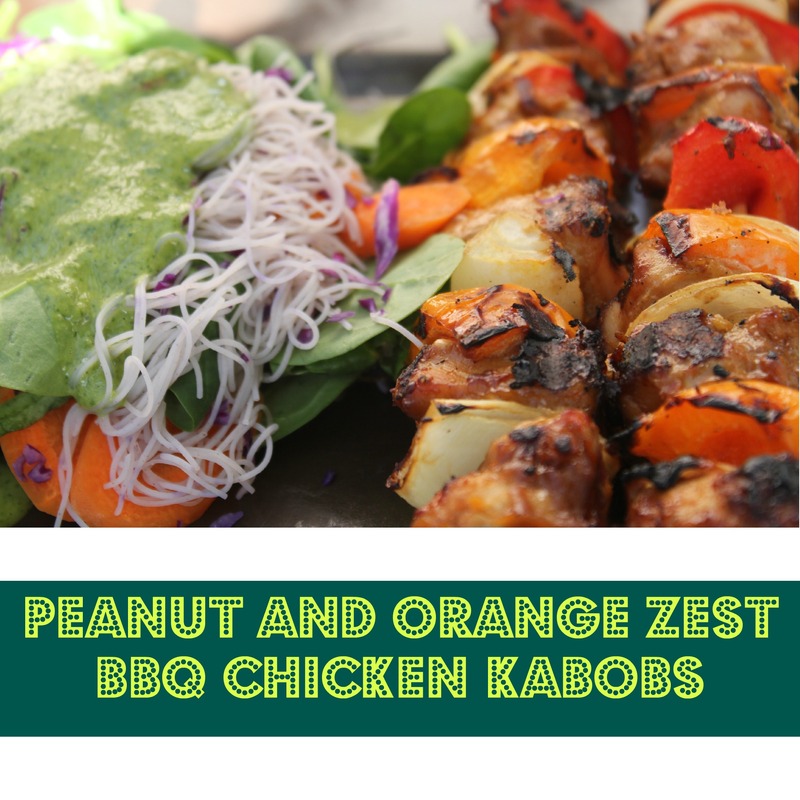 This recipe is freely enjoyed by people in our 30 Day Flip programs. Prepare the sauce first, so the chicken can be quickly dressed once fully cooked. In a saucepan combine all the sauce ingredients except for the arrowroot powder and bring to a gentle boil over medium-high heat. Whisk well to incorporate the ground ginger and to make sure there are no clumps. 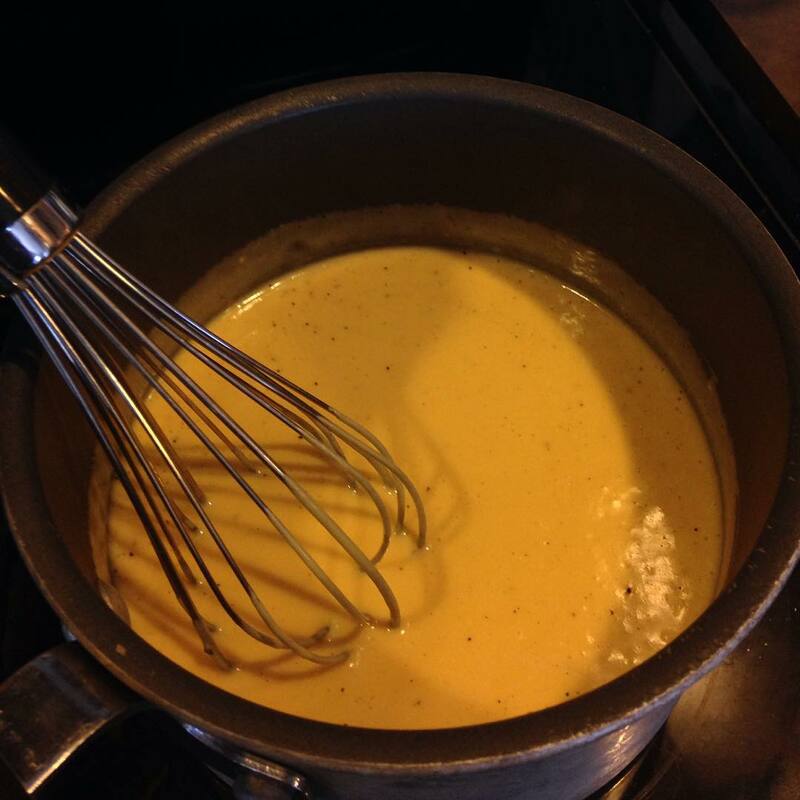 Once the sauce bubbles, turn off the heat and whisk in the arrowroot powder (this will thicken the sauce). Cover and leave it on the warm burner while the chicken is ready. For the chicken, heat a large skillet and add coconut oil. Allow it to melt. In the meantime, prepare the chicken by cutting into bite size pieces. Season with sea salt. Place the chicken in the hot skillet (single layer) to sear. Leave the chicken for 3-5 minutes and turn the pieces over to cook the other side and continue cooking 3-5 minutes. Once the chicken is cooked, drain any excess juices from the pan, and pour in the orange sauce and add the toasted cashews. Toss the chicken and cashews in the sauce until evenly combined. Let it simmer over medium heat to thicken the sauce again (about 3 minutes). Serve over cauli-rice and top with sliced green onions! Place the cauliflower in a food processor fitted with the grating attachment and process, until chopped into ‘rice grains’.Pick out any large pieces that passed through the grater. Alternatively, grate the cauliflower with a cheese grater. *We used our Vitamix for this (only 1 cup at a time on low). Add the riced cauliflower and saute for 5 minutes. Add the remaining ingredients and continue to cook for 20 minutes until the cauliflower is tender. This past weekend Isla, Noah, and I thoroughly enjoyed celebrating Mom. Jen and I worked together to create an awesome yet simple Mom’s day experience. One of my wife’s love languages is quality time. Which means that if we as a family want to show her that we love her the best way to do that is to carve out some distraction free time together. So we started the day with breakfast and then went for coffee on our favorite patio and leisurely strolled along the waterfront in our gorgeous city Kelowna, BC. The day was topped off perfectly with a family BBQ. It was one of those relaxed and satisfying dinners that had you sitting back and sighing a deep breathe of gratitude. I encourage you to plan a family meal together this long weekend. Food means so much more when it is tied to relationship and not guilt. We had reasonable servings of delicious healthy food in good company and I am still smiling at the thought of what an awesome day it was. I posted a picture of our dinner and I promised I would share some of the recipes. SO here it is. 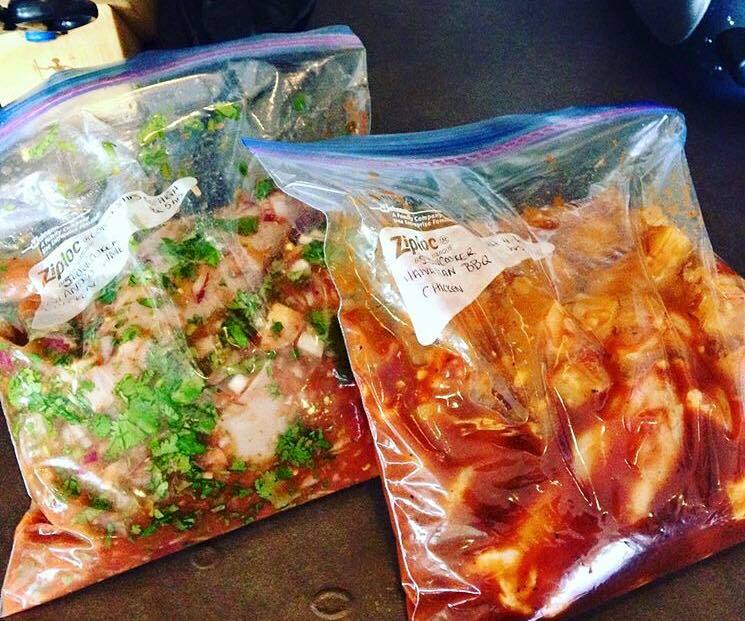 Add 4 cubed uncooked chicken breast to marinade and let stand in refrigerator for up to 8 hour. After soaking your wooden skewers in water. Skewer the marinated chicken and vegetables of your choice. We use red and orange peppers, onions, and zucchini. BBQ until chicken is cooked through. Brown Rice Noodle Salad With “Best Ever” Peanut Cilantro Dressing. Our dessert was lemon tarts (we cheated a little and used store bought pre-made tarts) The lemon filling was homemade from the cookbook you got to buy. Against All Grain. We are exotic taste lovers in this house. So curry is on our love list. I find it adds such flavor to a dish without the calories. I actually made this for Jen and I for lunch the other day. You can eat it like I did in a pita or if you have gluten sensitives you can place it on top of a salad or wrap it in a large leaf of lettuce. Place chicken on a baking sheet, drizzle with coconut oil, sprinkle with a pinch of salt pepper. Bake for 15 to 17 minutes, until cooked all the way through. Remove the chicken from the oven and cut into cubes. Chill in the refrigerator for 30 minutes. 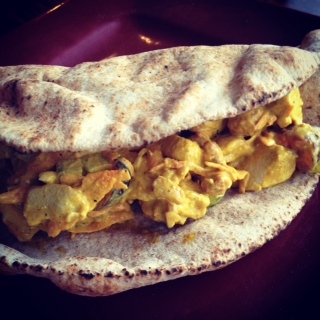 Combine the mayonnaise, grapes, cashews, celery, red onion, carrots, salt, and curry in a bowl. Add the chilled chicken and toss to coat. Chill in the refrigerator for 30 minutes. Sprinkle with the fresh mint right before serving. YUMMMMM! Love it and my pregnant wife said it hit the spot too! This meal did Jen and I for two lunches. This is one of the recipes featured in Danielle Walker’s cookbook “Against all Grain” we highly recommend it. This cookbook has become a staple in our kitchen. Want to get more free recipes, tips, tv episodes, and inspiration in your inbox? click the menu you tab in the top right corner and fill out the subscribe form in the drop down menu. Our subscription option is right there in the left side bar. 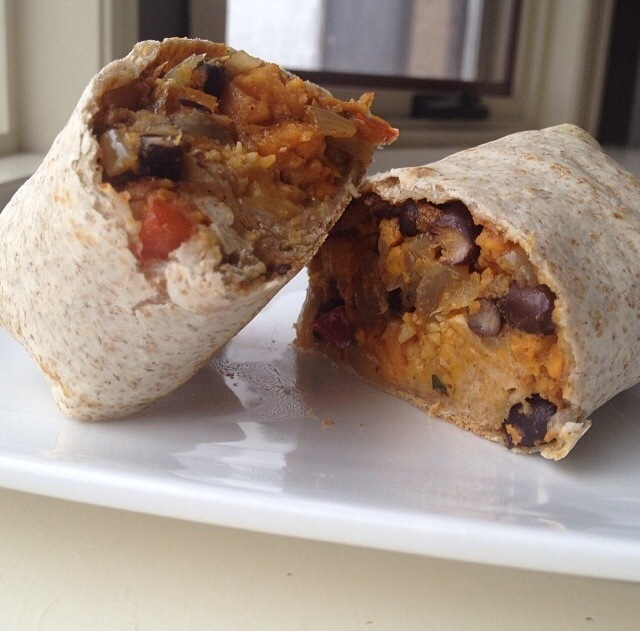 We love Mexican themed food in the McNamara house, so this recipe had us at the word burrito. Plus the fact that it is pretty easily prepared and goes over well at our table. Our Noah (4 yrs old) and Isla (turning 2 years old soon) polished off a burrito each for lunch today. In a 9 x 11 baking dish mix together peeled and cubed sweet potatoes, chopped red pepper, chopped onion, chili powder, cumin, and olive oil. Toss to coat vegetables evenly. Bake covered 25 to 35 minutes until vegetables are tender. In a separate bowl add together the can of rinsed black beans, cilantro, lime juice and sea salt. Once the cooked sweet potato mixture has cooled off combine it with the black bean mixture. Then evenly distribute the filling between 8 to 10 tortillas and fold into a burrito. Place the assembled burritos on a baking sheet and bake for 15 to 20 minutes at 375. Hope your family enjoys them as much as mine!